Request a quote for a bulk order for 5-Carboxylcytosine (5-caC) polyclonal antibody - Classic. Please fill out the form here below. Your local sales account manager will get in touch with you shortly and send you a quotation based on your requirements. Polyclonal antibody raised in rabbit against 5-Carboxylcytosine (5ca-CMP monophosphate) conjugated to BSA. * Please note that of the optimal antibody amount per IP should be determined by the end-user. We recommend testing 1-5 μg per IP. To demonstrate the specificity of the Diagenode antibody against 5-caC (cat. No. pAb-CaC-020/050), a Dot Blot analysis was performed using synthetic oligonucleotides containing different modified C-bases (indicated in red). 125 and 25 ng of the respective oligo’s were bound to a Streptavindin-coated multi-well plate. The antibody was used at a dilution of 1:1,000. The binding of antibody to the DNA was measured by ECL chemiluminescence. Figure 1 shows a high specificity of the antibody for the carboxylated cytosine. 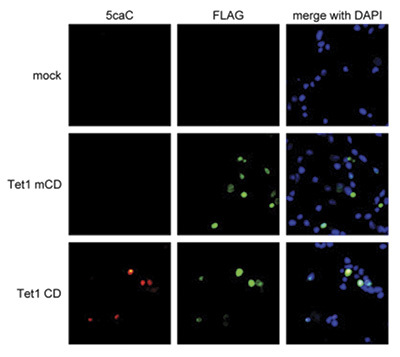 293T cells were transfected with either the mouse FLAG-tagged wild-type Tet1 (Tet1 CD) or the catalytically inactive FLAG-tagged C-terminal domain of Tet1 (Tet1 mCD) and stained with the Diagenode antibody against 5-caC (cat. No. pAb-CaC-020/050), diluted 1:500, and with an anti-FLAG antibody, followed by DAPI counterstaining. Immunoprecipitation was performed with the Diagenode antibody against 5-caC (cat. No. pAb-CaC-020/050) on 2 μg of J1 ES genomic DNA, spiked with 1 pg of a control DNA fragment (approximately 700 bp from the RFP (Ring finger protein) gene) containing different cytosine modifications. The mC and hmC control DNA was generated by PCR with the corresponding nucleotide. 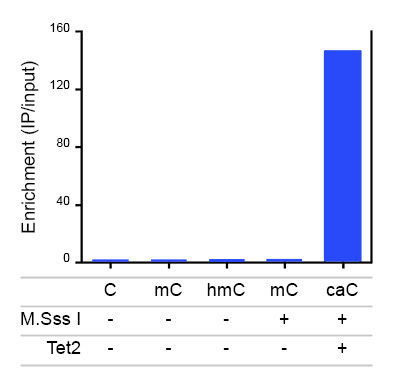 The caC control fragment was obtained by in vitro methylation using M.SssI methyltransferase followed by oxidation with purified Tet2. The IP’d DNA was subsequently anaysed by qPCR using primers specific for the control DNA fragments and for GAPDH, used as a negative control. Figure 3 shows the enrichment calculated as the ratio of the recovery of the control DNA versus the recovery of the GAPDH negative control. Until recently, 5-methylcytosine (5-mC) was the only known modification of DNA for epigenetic regulation. In 2009, however, a second methylated cytosine, 5-hydroxymethylcytosine (5-hmC) was discovered. This new modified base (also called the Sixth base) is generated by enzymatic conversion of 5-mC into 5-hmC by the TET family of oxygenases. Recent results indicate that 5-hmC plays important roles distinct from 5-mC. Although its precise role has still to be shown, early evidence suggests that 5-hmC may well represent a new pathway to demethylate DNA involving a repair mechanism converting 5-hmC to cytosine. This pathway could involve further oxidation of the hydroxymethyl group to a formyl or carboxyl group followed by either deformylation or decarboxylation. 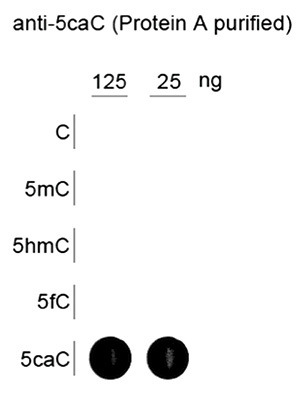 The carboxyl and formyl groups of 5-Formylcytosine (5-fC) and 5-Carboxylcytosine (5-caC) could be enzymatically removed without excision of the base. Due to their structural similarity, the different modified cytosine analogues are difficult to discriminate. The development of highly specific affinity-based reagents, such as antibodies, appears to be the most powerful way to differentially and specifically enrich 5-mC and 5-hmC sequences. We previously released highly specific antibodies directed against 5-mC and 5-hmC. Now, we also present a unique rabbit polyclonal antibody against 5-Carboxycytosine. Diagenode strongly recommends using this:	5-Carboxylcytosine (5-caC) polyclonal antibody - Classic (Diagenode Cat# C15410204-100 Lot# 001). Click here to copy to clipboard. Active and passive demethylation of male and female pronuclear DNA in the Mammalian zygote. Add Auto hMeDIP kit x16 (monoclonal mouse antibody) to my shopping cart. Add Auto hMeDIP kit x16 (polyclonal rabbit antibody) to my shopping cart. Add hMeDIP kit x16 (monoclonal mouse antibody) to my shopping cart. Add hMeDIP kit x16 (polyclonal rabbit antibody) to my shopping cart. Add TDG monoclonal antibody - Classic to my shopping cart.